GSam Battery Monitor provides more complete monitoring capabilities than the built in Battery Usage app in Android. It relies on the same battery statistic data, however it lets the user drill down and find out much more detail. GSam operates in two modes - Standard, and Enhanced Statistics. In Standard mode, GSam attempts to collect all statistics itself. Since KitKat, Android has made this harder and harder each release as they clamp down on security settings. This is a GOOD thing, but it makes the standard collection mode less useful over time. Enhanced Stats: By enabling enhanced statistics (Menu -> More -> Enable More Stats), GSam is able to access all raw batter stats that are maintained by the underlying platform. This does not require root, but it does require some manual steps by the user. The app will walk you through the steps to enable this. It's a pain, but is strongly recommended for for Nougat and beyond. Some of the statistics shown in this guide may not be available without the Enhanced Stats enabled. The main screen of GSam Battery Monitor provides you with time estimates, and shows the power drain of various components of your phone such as the Screen, Bluetooth, etc. You can access additional function via the Menu button, or by clicking on a row in the table with a blue > icon on the right. The Professional and Kindle Fire versions of GSam Battery Monitor look somewhat different when run on Tablets, but the basic function is the same. Average: An estimate of remaining time based on usage since the phone was unplugged. Some aspects of this may be controlled through the Power Per Percent setting in the Preferences. This setting should get better over time as the app learns more about your device. Note: The Professional and Kindle Fire editions will show an average for time spent active on devices that have no phones (or that are in 'airplane' mode). This allows a more accurate prediction of how much active use you can get out of the device. Last Xm: An estimate of remaining time based on the device usage over the last X minutes. The maximum X can be is controlled through the Calculate Time Left preference. X may be a small number depending on when statistics were last collected. Statistics aren't collected while the device is not in use, so if you pick up your device after extended sleep time, this number may revert back to 1 and slowly climb as you use the device again. Talk Time: An estimate of how much talk time is remaining. Note that this only shows up on devices with phones. To Full: When charging, this represents how long it will take to fully charge the device. Charge time can vary based on charger type (USB vs A/C) and usage of the device while it's charging. Used X% in TIME: X shows the percent of battery consumed based on your time reference (by default since you last unplugged the phone). The TIME section shows the amount of elapsed time since the time reference (typically how long since you unplugged your phone). All statistics have been gathered since the time reference. Phone: How long have you actually spent on the phone - talk time. This is only visible on devices with a phone. Screen Doze (8.1 and beyond): Amount of time the Always On Display was active, and the percent of overall time compared to the time the screen spent powered off. Discharge While On/Off: Percent discharge of the battery while the screen was on/off. Note that this does not represent only the consumption by the screen itself. Tip: A high discharge amount while screen is off may indicate a problem app running in the background. Screen Brightness: The time spent and percent of power used at a given brightness setting. The power is a percentage of the screen power consumed, not a percentage of overall power consumed (and so will always add up to 100%). Phone Radio: How long has the phone had a signal. Click on this row to get more details, including how long the phone has been at various signal strengths. You can also see the amount of data transferred over your mobile network. Battery Saving Tip: When your phone spends a long time at lower signal strengths, your battery will be consumed much faster. Wifi Active: How long has your wifi radio been on with a signal? Click on this row to see the amount of data transferred over your wifi network. Known Issue: When you turn on and off the Wifi radio, all data transferred stats are reset for wifi. So if you turn this on and off a lot, treat your transfer stats with a grain of salt. Battery Saving Tip: Android is pretty efficient about not using the Wifi unless it's needed, and data transfer over wifi uses less power than over 3G. So leaving it always on isn't a bad thing - just be careful if you have a very weak signal, and it keeps connecting and disconnecting. Deep Sleep: Amount and percent of time the device has spent in deep sleep with the CPU in it's lowest power state. Doze Time: Android supports a light and deep doze mode. The device will go into doze mode when Android detects it's not being used to save on battery. % Screen Off: The percent of time the device was in doze mode compared to the amount of time the screen was off. The higher this value is, the more benefit your getting from doze. Discharge Screen Off: The percent of battery discharge while the device is in doze mode compared to the amount while the screen is off. Averages Per Complete Charge: The lifetime averages that your device spends in doze mode for a complete discharge cycle. This is an estimated value since it's rare that a complete (100%) discharge cycle occurs. The max value represents the maximum measured value. Bluetooth: The amount of time the Bluetooth radio is on. We've seen cases where a misbehaved bluetooth driver doesn't allow the phone to sleep, however for the most part, leaving bluetooth on consumes negligible power. App Usage: This shows the % of power used by all apps on the phone. Click on this row to go into the App Sucker task where you can view all the details. Averages Per Complete Charge: Over time, GSam Battery Monitor averages the amount of time your phone lasts and amount of screen on time on a given charge cycle. Initially, this number will fluctuate considerably, but over time it should start to level out. This is an estimated value since it's rare that a complete (100%) discharge cycle occurs. The max value represents the maximum measured value. The Professional and Kindle Fire editions will show an average life spent active (not including Standby) for devices without phones. This gives a better prediction of average life for devices that have a long standby time. You can reset the average value in the Preferences menu - but once you do, you'll have to re-establish your usage patterns. The average is calculated whenever you plug your phone in to charge. You have to have used it for a good amount of time however, or that number will be ignored. For example, if you only used your phone for 15 minutes and re-plugged it back in, GSam Battery Monitor doesn't include that time in it's averaging. On devices without phones, the standby time can be very large (many days). The time you're most interested in is your in-use time, and so for such devices, Avg. Life shows your in-use time rather than your overall average battery life. If you want to see the overall average, click the button and share to an application, and view the text provided - it will include both overall and in-use averages. The App Sucker tasks shows all applications that have consumed resources on your device since the given time reference. You can sort the apps by a number of categories. Clicking on an app will show you lots of gory details about that app and it's usage. View % Power (Background CPU Only): Same as % Power Used, except foreground CPU usage is removed. This lets you see what apps are using the most power when they're running in the background. If you're actively using an app (running in the foreground), it's CPU utilization isn't quite as interesting from a battery saving perspective - you may really want to know who's consuming resources in the background. View CPU Minutes Used: Sort by the amount of CPU used by the application. View CPU (Background CPU Only): Same as CPU used except foreground CPU usage is removed. For more information, see % Power (Background CPU Only). View Network Data Used: Sort by the amount of network data (wifi or 2/3/4G) used by the app. Note that depending on how the app gets it's data, not all apps will show usage even when you think they should. This is a limitation of how Android collects it's statistics. View Sensor Time Used: Sort by the aggregate amount of time an app has used various sensors. This let's you see apps that may be using sensors improperly and not releasing them when they should - this can be quite power draining. NOTE: By default, GSam collects sensor data usage, but does not use it to calculate app power draw because of bugs in many devices estimate for a sensor power draw. You can change this behavior in the preferences. View Time Held Awake: Sort by time this app has kept the device awake. This looks at partial wake locks - the type that keep the device awake even when the screen is off. This is a warning sign of a misbehaving app - however there are many many valid reasons for using partial wake locks - even when the sreen is on, so don't accuse an app of being bad just because it uses these. View Num Times Waking Device: Lists the number of times an app has done something which might wake the device. Note that this doesn't mean the app DID wake the device. High values here may be a red herring - so use these with caution. View GPS Time Used: Sort by the amount of time the app used the GPS. GPS usage is VERY battery intensive. View Kernel Wakelocks: This is a very advanced option, and is not for the average user. The kernel is essentially your core Android operating system. This will list the wakelocks that have been held while the screen is off, but since this is the core operating system, there is little you can do about it directly. Click on the wakelock and then you will get the option to Google it. For more information, see the Kernel Wakelock blog post. lots of details about the app. Most data in this screen should be self explanatory. Keep in mind that an app may be a collection of processes and packages which we attempt to show. Usage Details: The usage details should for the most part be self-explanatory. Note that some functions that the app may perform do not always get attributed to the app. For example, some network usage may be attributed to a different application which performs the service function. Wakelock Detail: This shows the amount of time, number, and name of the application wakelocks. Apps that wake up the phone a lot, or spend a lot of time holding wakelocks can be problematic, but aren't always. It's perfectly reasonable for example that a game will hold a wakelock keeping the screen on for as long as your playing the game. Since Last Unplugged: This is the default for GSam, and show you stats since you last unplugged (or restarted) your device. Since Last Full Charge: This shows you stats since the last full charge (> 90%). Note that this may mean you see a %used of > 100% if you charged your phone to less than 90%. Since Screen Off: This shows you stats since the screen was last turned off. Every time the screen turns off, GSam will create a reference point. This helps diagnose apps that are consuming power in the background while the screen is off. Since Now: This lets you create a custom reference point. You can only have 1 custom reference active at a time, and this reference will get reset on reboot or unplug. you see what events were happening at a given point in time. Do you see a precipitous drop in battery? Try and see what event caused that - perhaps you were in an active phone call? Perhaps you had GPS on? AOD - Always On Display (new for 8.1) shows time spent with the screen off, but the Always On Display (Ambient Display) active. Active - shows time that the device was active. Either with the screen on, or with active wakelocks. You may need to zoom in to get a more accurate picture. Doze - shows the time spent in Doze mode. The darker color indicates Deep Doze. Phone Signal: A poor phone signal is often a cause of battery drain. You can plot your phone signal quality alongside your battery drain. Rate Of Change: Shows the rate of change (battery discharge). This can be useful to quickly zoom in on problem areas. CPU: This plots the CPU Utilization and CPU Average Frequency. This is sampled data over time, and so should not be taken too literally. That is, look at the overall trend, not a specific datapoint. A status icon will appear in the status bar indicating the current percent of battery remaining. You can customize this icon by theme in the Preferences. There are add-on icon packs as well, some created by GSam Labs, and some created by third parties. In the notification menu, you can see the latest time remaining estimates. For more on the Estimates, see the Main Screen section below. Clicking on the notification message will launch the app, allowing you to get to the Main Screen. You can chose not to show the notification icon at all if you already have an alternative way to see the battery percent. Even better, on Jelly bean you can show the notification status without showing an icon. An Overlay icon is also supported (requires the Icon-Pack add-on). This allows you to overlay the stock battery icon in the top right of the screen. It's size and location is fully configurable, and it should automatically hide when an app is in full-screen mode. For more information, see the Overlay blog post. Widgets: There are 2 widgets supported and are pictured on the right. You need to have the app installed on internal storage in order to use widgets. You can add them to any screen just like any other widget. Alarms: You can set alarms to notify you when your battery is fully charged, or when it reaches a certain low-threshold. These alarms will audibly and visually notify you. The 'Hot Battery' alarm will notify you when your battery gets too hot. The alarm will stay in your notification tray until your battery gets back to a normal temperature. For every 'device' using GSam Battery Monitor, we can see some basic device information - the type of device, the version of Android, and the version of GSam Battery Monitor in use. No personal information of any sort is sent. See how users are using the app. This lets us make improvements to the application over time. Note: If you turn his off, you will see Ads on the Free version (which is otherwise, ad-free). No ads will ever be seen on the paid version. Device Power Profiles: Every device is shipped with a power profile that allows the manufacturer to indicate how much power a given function uses. For example, how much power does a phone call use, how much does the screen use at various brightness settings, etc. All % Utilization values depend on these - so if the underlying reference data is bad, so will our statistics. You can chose to use a custom profile and edit the values - but use caution here. Only use this feature if something is clearly wrong. For example, I saw a Samsung phone where the Sensor utilization was really out of whack (using the Accelerometer for 5 minutes claimed to use 95% of the devices power). Note: Adjust the Device Power Profile with care. There are very few devices that need adjustment. Power Per Percent: You shouldn't touch this setting except if you change your power profile. If you do, then zero out the value in here. This value gets used to calculate estimated times remaining, so if your time remaining seems completely wrong, you can adjust these numbers. They are automatically generated based on your usage, and so if you manually change things, you may want to set the TOTAL_PERCENT_MEASURED value to be very high as the higher it is, the less current usage will affect the POWER_USED_PER_PERCENT_DROP. GSam Battery Monitor uses the following Android permissions. Used to send anonymous statistics using the Flurry and Google Analytics service (user can choose to disable this). These statistics allow the development team to learn how users are using the app. No identifying data is sent. Used to display a chart in the Charts view using the google chart API. Required to retrieve detailed statistics on battery usage. All detailed data such as how long various resources are in use come from this permission. Used in conjunction with the INTERNET permission. It will check if the device has network access before trying to use the network. Let's the battery monitor start up with your device is started. You can disable this in the preferences if you want it to start manually. An Android bug introduced in ICS requires the bluetooth permission when reading the battery statistics. This happens particularly with some car / bluetooth docks. It should not be required, but it's added to ensure that devices with this bug can still obtain battery stats. 07-13 16:54:07.727 E/com.gsamlabs.bbm.lib.NotifyingService(10114): Caused by: java.lang.SecurityException: Need BLUETOOTH permission: Neither user 10120 nor current process has android.permission.BLUETOOTH. Allows selection of notification tones (for alarms) that the user has stored on their external storage (SD Card). This is a new for Jelly Bean. Previously, Android allowed any app to read from external storage, however new in Jelly Bean, if the user configures the Developer Options -> Protect SD Card option, then apps will need this permission. Allows GSam to track when your phone is in use. On the main screen GSam shows the amount of time and power drain when you are in a call, so it's important to know when the phone is being used. Rest assured, we do NOT use this to track anything other than a simple 'in-use' statistic. We don't track or record any information about calling numbers, etc. This is a new for KitKat. Previously these statistics were available directly from Android without manual tracking. In KitKat, access was removed, so we need to track this ourselves. See this post for more information. Allows GSam to track when your wifi is turned on. On the main screen GSam shows the amount of time and power drain when your wifi is on, so it's important to know when it is being used. Rest assured, we do NOT use this to track anything other than a simple 'in-use' statistic. We don't track or record any information about accessed devices, etc. This is used to retrieve BATTERY_STATS on KitKat (4.4+) based devices when paired with the Root Companion app. The Root Companion app may be used by other apps, and so it is important that users are notified that a consuming app is retrieving Battery Stats. Users on Android 4.3 and earlier can ignore this permission. I have purchased your app from Amazon for my Kindle Fire. The status icon does not appear in the status bar. I re-booted the Kindle--still no icon. I deleted your app and re-installed it and re-booted the Kindle Fire and still no icon. The Kindle aggregates notification icons and collapses them into a single number that shows up in the top left corner of your Kindle (right after it says 'YOUR_NAMEs Kindle'). Click on that top left corner, and you'll get a dropdown showing all the current icons - Badass Battery Monitor should be listed in there. Amazon modified the base Android operating system to provide what they felt was a better use experience for the Kindle - and this involved not allowing the status bar to get cluttered with icons. The Badass Battery Monitor Icon Pack now provides the capability to overlay the Kindle's battery icon in the top right corner. Ya but it says the theme isn't supported by my kindle fire. Paid 2 dollars? Really? It said kindle fire edition.. The theme is definitely supported on the Kindle - I wrote a good portion of it exclusively for the Kindle (the Overlay feature). I think the confusion lies in needing to first select the theme (after you install the icon pack) before the Overlay feature will work. Once you've installed the Icon Pack - go into the battery monitor Preferences and select Icon Theme - choose one of the themes that you installed (will be below the 'Get More Themes' option. Once you've done this, you can select 'Overlay' and it will work. Little Known Way To Bring Nearly ANY Dead Battery Back To Life again..
Is it possible to make an option to get stats on battery cycle from 80% (or ser value) normally I charge until 80 to 85 %. Thank you for clearing that up. You might want to post a response to the reviews of this info on the Amazon page for your product as other reviews mention that an icon does appear on the status bar. I can't get it to start when my Coby Kyros 7022 boots. What version of Badass Battery Monitor are you using? The more recent versions fixed a bug introduced in Ice Cream Sandwich 4.0.3 that prevented the BBM from starting on boot. So update to the latest BBM version (2.5 is now available) and it should start on boot. As far as your widget options go - I've received a few other queries about this. I'm not able to replicate the issue unfortunately - the widget should be there. Can you let me know the exact level of Android that you're running? I also don't have Badass in my widget options. first of all, thank you for your work. One question: i am using powerAMP a lot and I'm wondering why it isn't listed in app sucker. Only for me? Hi - I just installed Poweramp and ran it - it is now showing up in the App Sucker on my device. The app usage is coming from the underlying Android statistics. What version of Android are you running? What version of Badass Battery Monitor are you running? Just purchased the Icon Pack for my Kindle Fire, but it won't open. Any advice? Thanks. Hi - the icon pack itself won't show up in your launcher as it's not a separately launch able application. Once the icon pack is installed, open up Badass Battery Monitor -> Preferences -> Battery Icon Theme: At this point there will be an option in the list - will be at the bottom of the list under the 'Get More Themes' option that contains the new icon (Circle - Big Numbers). Select this, and Badass Battery Monitor will now use the battery icons from that icon pack in your status bar and widget. . . .as you stated clearly in the description. Sorry I didn't read it more carefully. Please keep variety usage history as an option when/once the unit its plugged in. it should be cleared as options both manually and automatically between recharges. It shouldn't be a forced auto mode, our even the default as auto mode... You lose data... Something a log utility is not suppose to ever do automatically without the user selecting it or when a large or statistically amount of data has been saved as backup. To cont: a custom reference point isfinger to have but not if it then includes charge time.g. It is unclear in coding this option if it does our doesn't include charge time with an aggregating type reference. Furthermore there should be a way of auto saving histories between charges and viewing them along with history of the battery same options with history/charge time/temperature/decrease life etc. your utility could be rely amazing and helpful in the while life of the battery and of the phone if you then even track different batteries whether manually our if possible semi or fully automated. So much more you could do with such a few lines of code (coming from former expert in field before disability). Just trying to help. Thank you for a fantastic app -- I purchased the Kindle Fire version and it is excellent. However, I subsequently purchased and installed the icon pack and have found a couple of bugs, both of which involve the overlay option of the icon. With the overlay option enabled, one cannot install third-party apps -- specifically, the active overlay renders the "Install" button inoperative. Once the overlay option is de-selected, installing an app functions normally. The second bug (already referenced in your app) involves the failure of the icon o erlay to recognize the absence of the status bar and continues to display when unwanted (when reading a book). I sincerely hope you will work on the overlay/status bar problem as many of us LOVE this feature! I am currently working on addressing this, but it is proving to be quite a challenge. I'll be posting an updated version as soon as I have this issue resolved. I've figured out a way to resolve the issue where you can't click on the 'Install' button. I'll be posting the update to Amazon shortly - it should be available for download by the end of the week. I'm also having the overlay problem, not only does it block the install button, but also a page turn button in the lower right of another app. Your battery icon does not stay in status bar after rebooting, even though I have selected it in preferences. Any suggestions? HTC EVO 4G. Thanks. Figured out problem (above post): BBMonitor needs to be installed to main memory. Not able to post stats to G+ after G+ update. I'm not sure what G+ did. I've been able to 'sometimes' get it to post, but more often than not it doesn't. G+ doesn't seem to be responding correctly to intents. I'll do some research to figure out if they are expecting data in a different format. My Avg. Life continues to show the same number, despite the fact that I've let my device discharge at least 3 times from 100% to 30% or less. The number is always a much lower average than what I'm thinking it should be. I've got an Acer Iconia Tab A100 with ICS (4.0.3). The Avg. Life shows 5h 47m, but I know I'm getting well over 14h on each charge. For tablets without a phone / 3G radio active, the average life shown is the 'active' life rather than the overall time between charges. So - active life is how long you are actively using the device - screen on or held awake, etc. The time when the device is in a deep sleep isn't counted. Most devices without an active 3G radio will use very little power when in deep sleep mode - and can last for many many days without a charge, so the active life is a more useful stat. Hi, I really appreciate the work put into the battery monitor. I have a question - I always have my wifi turned off but the wifi/radio shows activity. shouldn't just the radio portion show MB usage? Interesting - it appears that in Ice Cream Sandwich, the network stats between 3G vs Wifi are no longer distinguished. I'll have to investigate how to pick up the difference again. Thank you for the prompt reply. I am not running ICS. Running Android 2.3.6 version 6.12.181 on RAZR Maxx. I am trying out this app on galaxy note running on ICS 4.0.3. Other then the overall battery level left shown on top portion of the main screen and the chart, nothing else get refreshed. It is always showing the same battery usage values for everything else. For Phone is always 0%, screen is always 48.2% regardless what screen brightness I select, wifi is always 0% despite I download this app, browse internet using wifi. App usage always 51.2%. The values are never got refreshed regardless how many times I click refresh. I even reinstalled the app but it is just still showing exactly same values as before (screen 48.2%, etc). Anything I may have missed out to get this app working? Thanks for any advice. I suspect your phone is plugged in - BBM will show you detailed statistics for usage while the phone was running on battery. It doesn't keep track of stats while the phone is plugged in other than the actual battery %. Try unplugging your phone and you should see the numbers start to change. I love the app for my kindle fire but how do I use widgets. also on one of the updates the Icon was replaced with a long battery, but now it is gone. Is there a way to get the long battery back? Launch into the battery monitory -> Menu -> Preferences -> Select 'Overlay Standard Battery Icon'. If that gives you an error message, make sure you have the correct theme selected in the 'Battery Icon Theme' menu. I hadn't noticed a delay before, but on ICS it does sometimes have a slight delay. I'll look into it. I recently purchased the Kindle version, with the Icon pack added to it. The Usage remaining has never shown a value, it is always calculating. Is there some setting I should look at, something I may have inadvertently changed? Thanks, by the way, great app. 1) If your charging, it needs to charge up 5% the first time before it has enough data to provide an estimate. 2) If your on battery, it needs to have discharged at least 5% the first time before it has enough data. In general, this is a one time-only thing. This should not happen in perpetuity. If it is continuing, please email me directly (gsamtan _at_ gmail +dot+ com) and I can help try and figure out what is happening. I enabled the custom profile without setting up the profile, unchecked it and everything started working again.....user error. I am using your BBM on my razr Maxx with ICS and I've noticed that the app says calculating, check back later ALOT. It stays there constantly after I remove my phone from the car dock and the only way to clear it is to restart my phone. Also sometimes it happens if I plug my phone in to charge but doesn't get to fully charge. I can handle the recalculating message but it clears everything out. My battery level is 0% and all other levels are 0% and the only thing that i can see is in the notification area. Help? I've had another user report similar behavior with a Samsung phone and a car dock - it seemed pretty specific to the car dock. I'd definitely like to capture a logcat when this happens. If you're willing to help with that, please contact me directly (gsamtan _at+ gmail +dot_ com). Just sent you an email. Thanks! I have the same "calculating" stat whenever I take my razr maxx off the car dock. Any fix for this? Unfortunately, not with the current implementation. The battery monitor relies on the underlying Android Operating System to keep track of the battery statistics. Android wipes the 'since last unplugged' stats every time the phone reboots or is plugged in. I have thought about creating a copy of the statistics so that they won't get wiped, and perhaps it's time I finally did that. I'll have to think about how best to implement the feature. There's a reason Android wipes them - for the case where you plug your phone in while the phone is off, but I think it should be possible to still have things behave nicely. Thanks for the info. At least I know there's nothing more I can do and I'll just make sure I check the stats before any reboot. This is a great app and will look forward to any updates. Should be all fixed in the recent versions. Could we have an option to keep Kindle open to completely drain battery? Is there a reason why you want to drain the battery? With these batteries, there is really no reason such as 'memory' to do so anymore. Indeed, draining the battery completely can be harmful to the lifespan of the battery. Thank you for the awesome app! I do have one feature request. Would it be possible to add a battery bar like the one in the TEAM battery bar app? The most recent release supports an Overlay icon on all devices (the Icon Pack add-on is required). This is similar in concept to what the TEAM battery bar does, just implemented with an icon instead. I have had the same issue as Roger lately. When charging, I like quickly glancing at the number, and noticed it'll still say a low number, like 47, but my android battery icon indicating full charge. If I open the app, it 'updates' it to say 100%. I have a Virgin Mobile Optimus Elite, android 2.3.7 system. Yup - should be all fixed in the recent versions. I am having the same status update issue that the others above are indicating. The indicator in the upper left corner on my stock Motorola Bionic will not update unless I open the battery monitor and then close it. I have to do this each time I want to k ow the battery status. This just started happening for me with the latest update. 1) The latest update seems to have introduced a bug - if anybody is willing to gather logcat data and send it my way (gsamtan _at* gmail _dot *com) I'd very much appreciate it. 2) If you have installed either the battery monitor or the icon pack on your SDCard, make sure that when you plug your phone into USB to charge it doesn't mount the SDCard to the computer. If this happens, the app will stop running and therefore not update. Yup - by popular demand, in the recent release, you can select 'Dark Theme' in the preferences to get the black background back. Hi there, is there any way to also make the notification in the pull-down drawer/tray appear in dark theme? Thanks! Hi. I was wondering if you could elaborate a bit about what is meant by the 'active' plot line on the battery history graph. Presently, my 'active' plot shows the expected dotted/dashed line from Juice Defender periodically waking the phone overnight. However, from 6AM onward, the 'active' plot line is solid. It is presently 9AM and the App Sucker does not show any apps with 3 hours' worth of wakelock time so I assume the 'active' plot means something else? * Any active 'call' in progress? * Is the screen on? * Does an app or the system hold a wakelock? The app sucker only shows apps that hold wakelocks. There are other system wakelocks that are not shown (root is typically needed for that capability). So it's entirely possible that the system is holding a wakelock. One symptom I've seen is the Bluetooth radio never relinquishing it's lock - so look at your bluetooth on time, does it map to your active time? I just started noticing the that status bar notification icon moves around from its original position. As new notifications are added i.e. email the battery icon moves to the right. Now I have one or two spaces on the left before the battery icon. I just installed this, along with the theme pack, on a brand new Kindle Fire HD. I cannot seem to get the icon to change, despite trying to do what you suggest doing. Am i doing something wrong or is this due to something in the new Kindle you haven' addressed yet? Version 2.19 should enable this feature again on the Kindle HDs. The icon pack however is still waiting on Amazon to approve an update which will fix the size and auto-hide issues on the HD. I cannot get the audible alarms to work on my Sony Xperia go and mini pro phones, they did work until a recent update was applied, apart from that a good app. Hi I just purchased the pro version and I cannot get the low battery sound to work on my HTC evo 3d but I still love this app can you please help me ? Hi - do you see any kind of notification? When the low battery is triggered, it should put a notification alert for 10 seconds into your notification tray and play a sound. Note - some phones allow you to turn off notification sounds - in which case you won't hear anything. G'day! The app description says that the overlay size and position is configurable. How do I access the controls for this? I've looked everywhere (except, obviously, the *correct* place)! Thanks for the help and all the work you've done to make a very sweet app! Configuration is done via the Icon Pack app directly, not through the battery monitor. I'm an upcoming version, I'll add a 'link' to make it easier to find. In the meantime, open up your app launcher, and open the Icon Pack app - there is a Configure button there which will allow you to tweak the location and size. Hi - the support email address is listed on the Nook website under the Product Details page (http://www.barnesandnoble.com/w/gsam-battery-monitor-gsam-labs/1111944224?ean=2940043908599). You can also find it in the About Me section of this blog. Thanks for letting me know about this problem. I have confirmed the issue on the Nook and will work on a solution. I'm not yet sure of why it is happening on the Nook. As far as the icon location - to get this to work on the nook, you need to unselected the 'Show only when status bar is visible' option in the preferences. At that point, it should start showing up. You can configure the location by launching the Icon Pack directly. There is an upcoming change that makes accessing the configuration for this much easier. hi i have one small problem in my sgsii ,i have the free version of the app ,i have it in use for almost one month but i cant see in the right bottom of the main screen the avg life of my battery .the version of the app is the latest in the app market. Hi, once it goes through a few battery cycles, the average life estimate should show up below the list of battery drainers. Can you send me a screenshot of your main screen so I can get an idea of what it is you are seeing? You can email me directly - check the About link in the top of the blog for my email address. Shouldn't these numbers = 100%? Not necessarily. The default mode for GSam Battery Monitor is to monitor since your last unplug. So, if you're batter was at 85% when you unplugged it from the charger, you would see those numbers you list above. You can change it so that it shows you battery use since last full charge. In that case though, sometimes your battery use is > 100% if you plug/unplug it a few times. any help with my problem? I just installed this app on my Razr MAXX running Android 4.0.4, and there are no widget options when I go to add one to my home screen. Any ideas? Typically this means that you have installed the app on your SD Card. Any app installed on the SD Card isn't allowed to have widgets. If you move the app back to the main phone storage, you should see the widget options. If that still doesn't work, try a reboot of the phone - I have heard anecdotaly of this resolving the issue with widgets not appearing. I just installed this app on my Nook HD+. Results in a dimmed icon for the percent left and a bright bubble icon. am I missing something? The notification icon is a persistent one (since it updates constantly), so you can't Clear it. If however you don't want the notification icon to show up, go into GSam Preferences and unselect the Show Notification Icon checkbox. If you do this, you'll have to launch the app in order to see the % remaining. Alternatively, you can grab the the Icon Pack which allows you to 'overlay' the % remaining icon over the stock battery icon. This let's you turn off the notification and still see the % remaining. Very nice app. Just a couple questions. How is it that you are calculating power consumption as a (%) of overall power loss? For instance, as a bbs user, I sometimes fuss a bit over the wakelocks as well as the awake-time minus the screen-on time. And, I see that as of right now, battery usage stands at roughly 5.75 hours with an "awake time" as reported on the main screen as roughly 1.4 hours. This I presume is indeed the total awake-time minus the screen-on time. 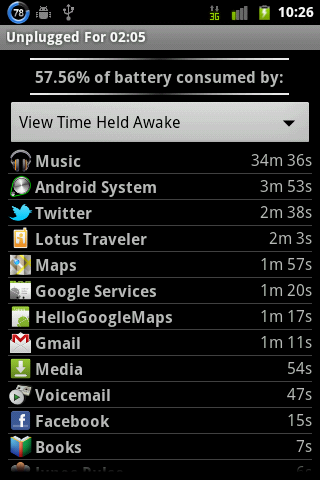 And, I also see the percentage loss from this "awake time" is a paltry 1%. How do you arrive at that 1% figure? If it's indeed that low, I may as well just turn a few background services back on relating to location settings to see what sort of impact there is. But, to me, it almost seems as if you do not count an app's activity as a % of battery loss while said app's activity occurs during the "awake time". In other words, let's say a "heavy" app contributes 10% battery loss, as reported in GSAM. And, let's say that the app requires 50% of its usage while the screen is on and 50% while the screen is off. Could one then say that the "awake time" as reported by GSAM's front page could not be lower than 5% (50% of 10%)? I suspect that is NOT how GSAM calculates the "awake time" impact on battery as a percentage. I suspect that what's going on during the "awake time" is that, in addition to the 1%, you have the partial percentages of all the apps contributing to the wakelocks, which would make that 1% figure significantly higher. Hopefully, this made a little sense. The awake time is indeed total wake time minus screen on time. The power shown for held awake is the amount of power used by the processor when it is idle. This is fairly small, and does not reflect the true cost of keeping your phone awake. Focusing on wake locks is very important. The held awake time is really a signal to look into what app is holding things awake. Hi. I totally love your app, thanks so much for all your work! I was very excited to buy the new icon pack to enable the status bar overlay on my Kindle Fire HD. One feature I'd truly appreciate would be an option to show some indication of charging status, be it change in number color, or background color, or pulsing -- whatever would be the least objectionable. As is I'm running your icon on the opposite side from the Kindle's. Seeing the actual percentage is what I've always wanted, but I also need to know whether there's some problem with charging. I'd like to bring this feature back! A charging indication like change of color or something would be nice, as it was before! Hi, I really appreciate the work on your battery app, its great. I noticed after the last update, I input a set number (110) for the alarm to notify me when the phone hits my preselected number in degrees. However its been going off at 85°? I have a droid DNA and it is stock. Does the setting actually stick? In other words, after setting it to 110 and clicking OK, if you go right back in and view what it is currently set at - is it 110? I just downloaded this today to try out. 2 issues i'm seeing. The biggest is it is showing a phone radio as drawing a fair bit of power. But this is a tablet with no supposed phone radio, and is in airplane mode with wifi off. What is it detecting as a phone radio? It's showing it at 0 signal strength, and scanning the full time. I'm trying to determine my battery drain, is this actually measuring something? Also, on the main screen where it shows the power %, i had a weird thing where the app% was at like 186% and the phone radio and screen was at a -% each for a while.. Any idea? This was a;; done on a custom monitoring spot to get fresh data. Hi - can you let me know what tablet you are using? It is incorrectly reporting a radio device (the Nook tablet does the same). I can special case the tablet so it won't report or look for a radio. The custom reference power calculation will get messed up if the radio is getting reported but doesn't really exist - all % stats will. I've verified the tablet has no radio, but it still had services installed as if it did. I froze the telephone apks and removed the radio log file(which it was writing to constantly saying it couldn't find the radio.. so it prob was eating battery) and it seems to have corrected gsam from finding and reporting on it. Record say the top 3 apps and the % of resources they used at the specific recording periods so you could click on the graph and it could tell you what was using the resources at that time? Also seeing you already have most of the logic built in, could this tool be expanded at all where rather than only monitoring, recording, and reporting while on battery, would it be possible to have it record/report on process usage while on power as well so that we can have a complete picture of the various apps and their power usage and requirements? Strange - I'd recommend completely uninstalling and reinstalling the app just to make absolutely sure your data got cleared. PURCHASED THE APP FOR NOOK TABLET. WHY DOES IT ASK ME TO PURCHASE IT AGAIN EVERY FEW DAY, SAYING INCORRECTLY THAT IT IS A FREE COPY???????? Sorry your encountering this issue. You are the second person I've heard of with this issue - it appears to be an issue with BN not downloading the paid version of the app after you installed it. To get past this, remove the app from your Nook, and then re-install it. It should continue to be available for download as you've purchased it - so it's just a matter of removing the trial version and getting the paid version installed. Hi there. I just bought the monitor and icon pack for my kindle fire hd. I cannot find the icon pack in my apps and it doesn't show up as a theme under preferences. Am I doing something wrong? I have tried restarting the kindle and downloading the icon pack and nothing works. Hi - if the icon pack is not showing up in your App list, it likely means that it hasn't yet downloaded from Amazon appstore. Go into the appstore and browse to the Icon Pack - does it show as installed? I notice a problem when i use my qi wireless charger, it use it for 5 charging nights and at the morning, the icon in notification bar has disapeared. I have to choose an icon in the theme list to get it back. how do you quit the application, as in shut it down? Gsm battery charger guide is much useful blog,keep the work up.Car battery is the component to be taken with more care otherwise you could lose it soon. Can I ask a little enlightenment on what "Discharge while on/off" percentages mean? associated with internal combustion engines. How can I refresh the App Usage screen, the screen that says "App Sucker" at the top? The GSAM main screen has a refresh button right in the lower right-hand corner - that's easy enough. However, this button does not refresh the time and usage values in the App Usage screen, at least not consistently. The App Usage screen has no refresh button or menu item that I can find. The only solution I have found is to keep flipping between screens until GSAM decides for some reason that it is ready to update the App Usage data. What is the correct way to make sure the App Usage info is updated to the current time? I use latest version available on play store. Just wondering if you - or anyone else here - can help. Installed your app a week or so and ago and all was just fine. Now, however: mayhem. - My (stock / default) charge level percentage has disappeared from my lock screen (was *always* there before when the charger was connected). - If I turn my phone off and connect the charger, my phone will turn itself back on (never used to happen). - Even in GSam itself - when the charger is connected - GSam does not recognise this in any way whatsoever. The icon in the top left doesn't have a charge symbol in it anymore, the remaining charge time no longer displays in the drop-down menu bar, etc etc etc. Have tried turning the phone on and off several times, completely draining battery and then recharging, uninstalling and reinstalling app (several times), etc etc. Any ideas?! Phone is a stock Samsung Galaxy S (i9000) running 2.3.6. I really don't want to have to factory reset my phone because of this. Thanks in advance! Would like to know what the icons - buttons in the gray bar along the bottom of the Main Screen - signify / do? Especially the X and the one that looks like a sync? circular arrows - looks like Sync? RE the icons along the bottom of the Main Screen - Was an X; is now a + in a circle. What does the X mean / do? What does the + mean / do? Hi! I purchased the GSAM Battery Monitor some time ago, and the Icon Pack and the GSAM Dimmer today. I don't know whether this ever worked before (I think it did!) - but whenever I try to open the Battery Monitor Preferences I get a message to the effect that the GSAM Battery Monitor (Kindle Fire Edition) has stopped. I have uninstalled all 3 apps and reinstalled just the Battery Monitor, but it doesn't seem to help. I had loaded another battery monitor app yesterday, which I just deleted and reloaded GSAM and now - mysteriously - it works! I am able to access Preferences and set the GSAM icon to overlay the standard battery icon, and able to move it to any corner. Most recent update (this week) will not allow me to open Preferences - app closes every time. This happened on both a 1st gen and 2nd gen Kindle Fire. On Kindle Fire 1st it is also giving false hot battery alarms saying it is 158 degree F when device is cool to touch and graph shows temp to be 89 degrees F. Please fix these! Can you tell me why reports show "negative" values for % Power Used and CPU Minutes Used, too ? Is it a serious bug or i don't understand. How to change temp from fahrenheit to celsius? On the data usage post of the phone signal screen mobile data always shows as zero and Wi-Fi always had some data assigned to it even when I have had Wi-Fi switched off and have been using mobile internet only. Is this a known issue with Gsam? I have a tablet with 4g. I want battery monitor pro to run as a smartphone on my tablet, so it will take the 4g antennae power use into account. is this possible? Using stock galaxy tab2 sgh-i497, AT&T. Love your software, on all of my devices! How much battery does your app consume? Does it reads from a kernel log or is it running on background? Does not work with Kit Kat on Nexus 7. Will there be a fix soon? Since 4.4.2 the battery percentage shown seems to stall and show an incorrect value until the widget is opened then the correct value is shown again. I believe this started with the 4.4.2 update. Nexus 5 with root companion. I have the same question, since running 4.4.2, i have to coax Gsam to show the dynamic state of battery charge! Help! is there a way to edit the time format in the graph? How can the GSam app be really closed? I prefer to use it from time to time only, not to have it on permanently. However the app is not closing by using the back or home button, I can only stop it by rebooting. What is the solution? I have the pro version and since the update to KitKat, it doesn't show GPS usage and many more! Actually App Sucker only shows % power used, CPU minutes used, network date used, and kernel wakelocks. P.S. I don't have root. Hi, are you planning on any solution to prevent losing all current stats on reboot/poweroff? If an app is able to respond to the system shutting down, you could do the same stat calculations on shutdown that you do on plugging the charger in? When I open app sucker it says most of my battery is being used by kindle media. I'm assuming that is many different media apps. Is there a way to break that down and find out which specific apps are using up my battery? I'd like to start of by saying that I really enjoy the app you developed. I was using Battery Doctor before, and I find this to be more accurate and comprehensive. I was wondering about one thing though, related to a specific device: the Galaxy Note 3. When I attempt to charge this device using a certain portable chargepack and a USB 3 cable, I get a warning from your app along the lines of 'Warning: Voltage Exceeded (3.0V)'. I was wondering if you know whether that warning is meant for other types of devices, and whether, in fact, the Note 3 can safely handle that voltage. Thank you very much one again, and I appreciate your consideration. Hi - this warning is coming from Android itself. The battery 'health' is indicating it's running over voltage - and GSam bubbles that warning up to the user. Whether this really is a problem for your Note 3 or not, it's hard to say. You can disable this warning by going into the Alarms section of the GSam preferences if you prefer it not to come up anymore.. Thank you very much for taking the time to respond to my inquiry. I see that back in 2012 someone inquired as to why usage stats are reset after a reboot; you replied that it may be time for a fix. I'm just wondering if a fix was ever made, because this is an issue I'm currently dealing with. (LG G2, Android 4.4.2, ver 3.13). I've discovered that if I reboot my phone a few times during the day, the performance is better... So this is becoming a slight issue. Thanks! Hi, if I keep the setting as "Since last full charge", even then do the stats get wiped out whenever I reboot? Basically, I am trying to know the stats since I last recharged the battery to 100% and have done a few reboots due to some reason or the other. Will GSam show data only from last despite keeping it as "Since last full charge"?? (Testing this on a device which is not rooted). Hi, I notice something strange - GSam Battery Pro(v3.16) show different battery level than system (4.4.2) reported. When battery over 59%, both values are equal, less than that GSam show 1% less than system. I use program for 3 weeks, and until today, there was no such difference. I restart app, then reboot phone, then even reset all app statistics in advanced menu. Difference was still there, and after all, clear GSam app data to imitate fresh install, now there is no problem. Of cource, 1% is not big deal, but tommorow may have 10%, so I wonder, is it something that program should do, or some bug? Cause I love this app, and don't want to uninstall, but also want to tell me correct battery level. Seems to be only one home screen icon that shows estimated time left on charge, but no numerical percentage of battery used. Is there an icon that shows both. I can look up to status bar to see percent of battery left, but would be nice to see both on home screen icon. I am confused about what information or data, related to phone calls status and records are collected or transmitted. Allows the app to determine the phone number and device IDs, whether a call is active, and the remote number connected by a call." Allows GSam to track when your phone is in use. On the main screen GSam shows the amount of time and power drain when you are in a call, so it's important to know when the phone is being used. Rest assured, we do NOT use this to track anything other than a simple 'in-use' statistic. We don't track or record any information about calling numbers, etc." So, do you or don't you track or record any information about numbers called? Thank you for clarifying this for me. I wish you had a blog entry dedicated to permissions, it would save me having to wade through 150+ comments to see if my query has already been answered. I have an outstanding update to battery monitor that wants the "device ID and Call information" permission which you don't mention in your blog. I consider this one of the most important permissions that I don't agree to lightly. Can you add to your blog your reasons for needing this permission? The color does not work on my battery widget. The widget doesn't seem to actually do anything. The round one just shows a color and nothing else with a little battery in the center. I don't think this functions with the Samsung Galaxy s6 edge plus. Just went from the free to pro version of GSAM. The notification icon display is now essentially off-white-on-white. Not to useful. Tried changing themes. No effect. Also tried a restart. I'm on Moto X, 1st gen with Lollipop 5.1. Hi, I would like to have my charts reset every time I do a full recharge, so I can see properly how long the battery lasts on that single charge and what happened with the charge (the chart saying "3 months" is pretty useless). I'm using the kindle version. The battery percentage is off by two percent. This app is -2% from the actual battery. I've played with the settings, but nothing works. Please help. I can't find the root access inside gsm? When I hid the root companion app it told me I could access it through the gsm app, but I don't see it anywhere??? I'm using the Android version on Sony Xperia Z1 on Android 5.1.1. I've STAMINA mode on and a few apps whitelisted including the Battery monitor. For example: the mainscreen says used 35% in 10h and shows for "held awake" 1h and 1-2%, which seems pretty good. But if I go the "screen" details it shows me e.g. 1h 30min for "screen on" and then discharge on/off shows 17% / 18%. Where does this come from? Hi I recently purchased the nexus 6p and in the GSAM app, app usage, it was showing that GSAM app was consuming more than 75% battery in App usage. is this normal ? This app is having very high number of wakelocks. What if i limit them using Amplify? I can't locate gps usage data easily on mm using pro version. Since the Android platform 7.0 update I don't see the charge rate (mA) on the main page. I paid for the app in order to see h what is waking my phone from a sleep, but there doesn't seem to be that option. We are really needed LED notification. I have installed the app on my oneplus three device. The battery alarm function is not working. No alarm is ringing at all. Please provide solution. I've used "adb shell pm grant com.gsamlabs.bbm android.permission.BATTERY_STATS"
"Operation not allowed: java.lang.SecurityException: grantRuntimePermission: Neither user 2000 nor current process has android.permission.GRANT_RUNTIME_PERMISSIONS." I've tried free and paid version, none of them had worked. My devices are two Xiaomi, once running Android 7.1.1 and the other one runs Android 6.0.1. Also I use Linux (Manjaro), my distro has ADB installed by default. Would be super if it could also record and display history (charge/discharge) of my Moto supplemental battery (Incipio brand, also has wireless charging). Can you help? App sucker options doesnt work 4 me. First of all, I love GSam. This is the only one battery app on my Android phone. However, I only miss one function, a battery charging counter. I see other apps in the store whom can count the battery cycle. There is any possibility in the future for this feature? I've been using Gsam for some hours and I find it very useful. Nevertheless, I think there might be a problem with App sucker: in the list I can see only combined CPU apps and Gsam. But i've been using a lot of different apps in this time, most of all Firefox. Is it normal? I saw some picture on the internet where I can see it detects tens of different apps. Tried to grant permission via adb. 'Error: more than one device/emulator' Devices lists four different, one with a large number as 'device' and three emulators. How can I include the device name into the string? Operation not allowed: java.lang.SecurityException: grantRuntimePermission: Neither user 2000 nor current process has android.permission.GRANT_RUNTIME_PERMISSIONS. I have one particular question in regards to the GSAM chart. With my Galaxy S8 Plus, the active line is always dense with vertical bars even with WiFi off and 4G off. The only way to get rid of active signal is to remove both SD and SIM cards, and turn off WiFi. On my other phone Sharp Z3, that active line is empty throughout the night. Apparently Sharp turned off WiFi during the night, even though I set WiFi to always on. The problem is, what kept S8 active line busy? Currently S8 drain rate is more than 3% per hour. If the active line is clear, I got 0.1% per hour. This is without both SD and SIM cards, WiFi off, AOD off. My phone (bizarrely) sleeps during the day, but stays awake at night. I have tried just about every tool, rooted and unrooted, but it still happens most of the time. That active bar refers to the phone being awake, so you have an app, or apps that are waking the phone at those times. I suspect one of Google's service apps is the culprit on my phone, because those wakelocks are assigned to the OS by Gsam. You can try airplane mode, which should reduce the consumption by the sim and WiFi, and (hopefully) stop Google waking the phone with the service apps. This is about GSM technology related information and when i read this feel boring but every next line give me more information with energy and interest and finally i learned many things about GSM technology and the students of GSM this site is blessing.pakistan news live is updated source of information. Just updated my Galaxy Note 8 (AT&T) to Oreo. The Always On Display icon no longer displays the battery percentage. It always says "0", now. Is there something that I can do to fix this or do I need to wait for an app update. Dude thank for writing this. I purchased your app for my Kindle and have noticed an immediate improvement on my battery life! I am looking forward to your next update. Fuel economy: If you want to maximize your fuel economy you'll need a good GPS system. Saving money at the pump as well as wear and tear on your vehicle should be one of the main reasons why you would want a good . Accurate driving directions not only will save you time in your daily travels, but also will save you substantial gas money when travelling from place to place. This is especially important for delivery and courier services. Travel directions: will give you accurate directions for travel. Weather you are travelling locally, across country, or globally, you will get accurate direction and constant monitoring of your current position. I wouldn't think of taking another family vacation without a GPS system in my vehicle. Is there an ADB command to disable the enhanced stats? I'm having problems installing an OTA-update and the enhanced stats feature is the only thing not stock on my phone. Hi, many thanks for developing the app. I am currently managing a number of phones and I wanted to find out if the GSAM app is able to send either daily, weekly or monthly report to a predefined email address?. I don't want the user to interact with the app and send the reports but the app to send the battery data at a specified/predefined schedule. I am willing to pay for the app with this feature. You get the ruggedness of cast iron and the portability of DC power. This pump delivers up to 13 GPM/49 LPM. 12 Volt Fuel Transfer Pump is designed for tank or barrel mounting. Includes a 3/4" Manual (Unleaded) nozzle. Manufactured by Tuthill. Can you add signal strength in Dbm and ASU in addition to a range of Low-High in Phone Radio Usage as well as Signal Strength graph. Its an incredible joy perusing your post. It's brimming with data I am searching for and I want to post a remark that "The substance of your post is marvelous" Great work. USB debugging (Security Settings) - Allow granting permissions. You might want to consider adding this info to the instructions in your excellent app as Xiaomi devices become more and more popular. We are a Amazon Business consultancy team. Professional Amazon Product service provider for Good Sells. We are helping sellers to sell products on amazon marketplace successfully. We can make you best seller on amazon. Do you need to promote your Amazon Business? if you want more sells to your product we can help you. You can also flow our website for our work experience and justify. I downloaded GSAM battery monitor to my android phone and got charged by Googlw play. It doesn't show up in my appa. When I go to download it again there's a green window that says "installed" and another one that says "open in play store app? I simply wanted to thank you so much again. I am not sure the things that I might have gone through without the type of hints revealed by you regarding that situation. GSam Battery Monitor and KitKat As of version 3.3, GSam Battery Monitor is now fully compatible with Android KitKat (4.4) for non-root devices. If your device is rooted however, there are more statistics that GSam can collect. So if you have root, make sure you install the GSam Battery Root Companion app. If you don't have root - no problem, things will still work well, but some stats such as app wakelocks will not be available. Unfortunately, Google has removed the ability in KitKat (4.4) for non-system applications to access battery statistics. On versions prior to KitKat, GSam obtained battery statistics from a built-in set of statistics from Android. If you have root, we can still get at that data. If you do not, then GSam will track as much of that data as it can by itself. Not all data can be tracked however. 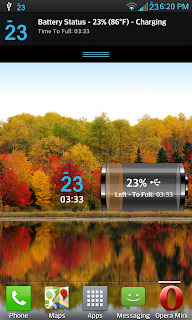 Version 2.28 of GSam Battery Monitor has added support for displaying Kernel Wakelocks. Kernel wakelocks are a very advanced feature, and are not intended for your average user. Indeed, I see so many users getting confused by them in forum posts that I have resisted the urge to add them in. They are often unique per phone / manufacturer, and a high wakelock time is not necessarily indicative of a problem. All that said, kernel wakelocks are very useful for folks trying to diagnose custom ROM problems. If you're running a custom ROM and are seeing battery issues, kernel wakelocks are very useful, and can help the ROM developer understand what is going on. For people using stock ROMs they are useful to simply understand how their phone usage affects their battery life, however this takes a lot of understanding and often a lot of research reading code to understand what a certain wakelock does.